A CDN is a large, distributed network of servers spread across multiple data centers worldwide. Your site data and content is replicated and stored in each data center within the network. Why store your content in more than one place? Because your site users live in more than one location. A CDN enables you to deliver content to individual users from the data center nearest them based on their geolocation. And that results in a higher performing web store with faster search results, faster product image and page load times, and faster check out experience. You don’t have to be an etailer of Amazon proportions to take advantage of a CDN. The Measured Search solution is a great option for small to medium sized online businesses looking to increase and support traffic within their own country and abroad. If you can’t yet make the leap to a CDN agreement to host your entire site in multiple locations, you can still take advantage of our Search-as-a-Service and distributed image serving offerings. This puts your on-site search capabilities and product images in the cloud, supported by a CDN, so the most important elements of your customers’ shopping experience will be fast and intuitive. Reduce bounce rates as visitors will no longer get frustrated by a slow site. Rank higher in search engines since Google favors faster sites. A Forrester study found that 47 percent of visitors expect a website to load in less than 2 seconds, and 40 percent of visitors will leave if it takes longer than 3 seconds. That was several years ago, and today’s online shoppers are surely even less patient. Every millisecond of load time impacts traffic, click-throughs, and conversions. Shopzilla decreased load time from 6 seconds to 1.2 seconds, and increased revenue by 12 percent. Mozilla once shaved 2.2 seconds off landing page load times and raked in an additional 60 million Firefox downloads per year. Walmart discovered that with every 100-millisecond decrease in load time, they could increase conversion 1 percent. The out-of-the-box Magento eCommerce platform is not optimized for search and page load speed. 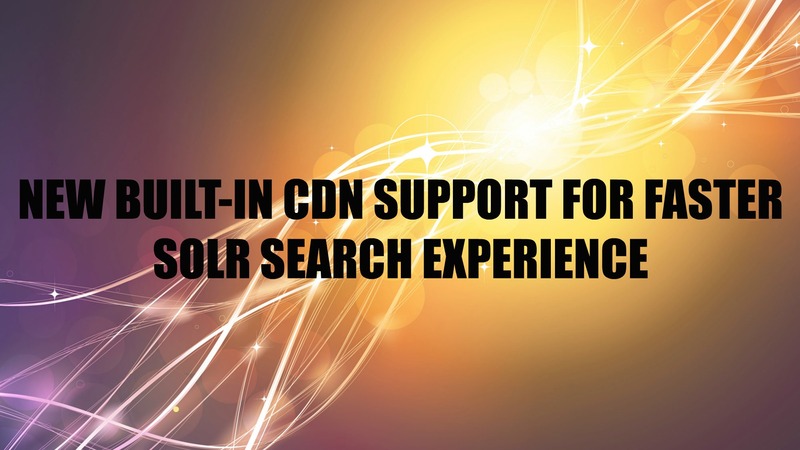 It needs extra support from a CDN to cut back on server burden and enhance site performance. If you want to start dealing in milliseconds, our distributed image serving service is a great place to start. The new CDN-supported Measured Search option for distributed image serving will help you supercharge online sales through dramatically improving a user’s search experience. Once an image URL is loaded into our search service, we download that image from the URL, process it, and make it ready to be served to visitors from over 50 locations worldwide, including the U.S., Europe, Asia, Australia, and South America. Measured Search makes fast, advanced, cloud-based, instant search possible. Customers searching your site can find what they want on the fly, or discover other relevant categories to browse. The search-as-you-type function does more than autocomplete users’ search queries. It can also display suggested product names, descriptions, images, and prices in a drop-down list. The suggested search list is responsive to users as they type, so results become more accurate with each added character. CDN supported, instant search results make the difference between a sluggish site that seems to generate information in a mechanical, impersonal way, and an intuitive site that makes the user feel understood and in command. Even if you operate a small eCommerce shop and your entire site is hosted on one server, you can still optimize your search functionality by using Search-as-a-Service and distributed image serving. Combined with the rest of the Measured Search for Magento features, you’ll see better overall site performance with less time investment and troubleshooting on your end. Are visitors searching for categories, descriptors, or synonyms that I don’t have on my site? If so, how can I integrate them in a way that will quickly connect people to the pages they want to see? Are visitors searching for categories, descriptors, or synonyms that I DO have on my site? And are those searches yielding the most relevant and useful results? Build a modern, fast, frictionless site, starting with user history based search and product suggestions that give visitors extremely relevant results. Contact us today for a free assessment, and learn how the Measured Search Magento Extension can upgrade your store. Advanced Analytics and insight reporting to help you manage and optimize on-site search. Seamless Integration that automatically syncs new and existing store products with your search query results. Scales with you as you grow and take on more traffic and sales. Backup & Recovery of your site, customer, and transaction data. Data Security ensured with encryption and access keys. 24×7 Support should you have any questions or mishaps. If you have any questions or need help, contact us anytime!